The Stateswide Instructional Materials Center manages the distribution of braille and large print state adopted textbooks for all students in the state who are blind or visually impaired. While publishers mass produce books about reading, writing and arithmetic for public and private schools, they produce none in braille, the coded language of raised dots embossed onto paper and read with the finger tips. The Instructional Resource Center works with suppliers across the country to locate braille and large books as SC students need them. 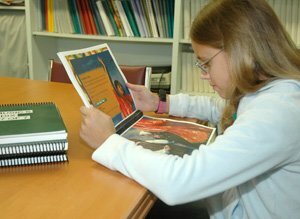 If a teacher with a student who is blind selects a textbook that hasn’t been produced in braille or large print, the State Department of Education relies on the SC School for the Deaf and the Blind to produce the needed textbook. The Instructional Materials Center distributes hundreds of large print and braille textbooks each year through its distribution center located on the main campus of the SC School for the Deaf and the Blind in Spartanburg. It also manages a braille production center in Greenwood.